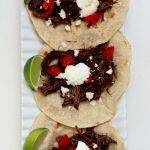 Small tortillas are piled with tender shredded seasoned beef, sour cream, tomatoes, cotija cheese and a squeeze of lime. The beef is cooked low and slow and becomes super tender in a over many hours. Desired taco ingredients: small flour or corn tortillas (I used uncooked tortillas and cooked them in a skillet), tomatoes, cotija cheese, lime, diced tomatoes, lettuce, etc. In a small bowl stir together the oregano, cumin, salt, pepper and olive oil. Rub this mixture equally over each of the 4 pieces of beef. Add orange juice, onion and garlic into the slow cooker. Nestle the beef into the crock. Cover slow cooker and cook on low for 8 hours. Remove the lid and use tongs to place meat on a cutting board. Shred the meat. Salt and pepper the meat to taste. Serve the meat in tortillas with desired toppings. Plan about 1/2 pound of beef per person. The roast shrinks down a lot.